Whilst for most in this great nation the first glimpse of Jack Frost’s bitter embrace in November signals the start of several months of gloominess brought on by darkened commutes, frosted-up windscreens and delayed trains, for football fans the winter season is a wondrous thing. It means a thick-and-fast onset of football – league tables are starting to take shape, and are helped to do so by a furious winter schedule; the romance of the FA Cup starts to take the attention of the nation and transfer babble starts anew. What often goes unnoticed – at least until the latter stages – is the FA Youth Cup, a tournament that never fails to disprove the old adage that “you win nothing with kids”. Tonight’s contest between i Hornette and Leeds was the first tie to be played in the third round proper – the round that sees all of the established academies enter the fray. The fortunes of the youth team should be of special interest to Watford fans, more so now than ever. With every takeover of a club comes questions and doubts. The fortunes of the senior side so far this campaign has helped create a good feeling about the Pozzo family, and after a good showing from Scott Duxbury, Gian Luca Nani and Franco Zola at the recent Fans Forum, most fans are satisfied that the Italians’ intentions are noble. The Harefield Academy, however, remains a sticking point. Eyebrows were raised when the club settled with Category 3 status for the EPPP, not least by the current scholars, who took to Twitter to highlight their consternation that they would be held back by playing the youths of Dagenham rather than Tottenham. To their credit, the management addressed these issues with fair explanations at said Forum, but the possibility must be considered that the explanations are all smoke and mirrors. The departure of Nick Cox, the Academy Director, (on which more is to come in the next few days) could also be a harmless bit of career progression, or the symptoms of disharmony between the visionaries of the old system and the moneymen of the new. Wariness is essential. In any case, In the Wolf’s Mouth endeavoured to follow the fortunes of these future Watford stars as they get their chance to face the big boys of youth football. Unfortunately, that quest started and ended tonight as they came a cropper against a Leeds side that seemed older, wiser and generally prepared better. It was a young Watford side that took to the pitch on a bitterly cold night in front of 535 shivering souls in the Rous. Seven of the starting line-up were first year scholars, with only Jordan Willmore, Kamaron English, Luke O’Nien and Bernard Mensah holding any previous Youth Cup experience. The team was set out in a 4-5-1 formation, with O’Nien playing a similar role to the one fans of the senior side will have seen from Nathaniel Chalobah, dropping very deep to collect the ball from the back line and act as a deep-lying playmaker. Bernard Mensah, the tall, quick poster boy for this Academy side, ploughed a lone furrow up front on his own, and for long periods of the first half was left incredibly isolated. The game started off evenly, with both sides sharing ineffective possession. Chances were few and far between as nervous and presumably freezing cold players struggled to keep a hold of the ball. Watford, to me, seemed to have been set up too deep. When Bawling or English were provided with the ball on the wings (though the latter’s right side of the pitch was largely ignored by both teams) they were positioned several yards short of the half way line, and with only Mensah as an outlet, were forced by Leeds pressing into playing long balls into the rangy striker’s chest – or over his head. As good as his touch seemed, there was never anybody around him to collect his layoffs or help him alleviate the pressure, but this was down to how the team were set up, rather than any player’s folly. This attacking inefficiency was matched by Leeds for the opening period, with Watford captain Jorell Johnson cutting an imposing figure. He seemed to me to be in the mould of a young Adrian Mariappa – quick to react and get himself to the ball, with a similar gait and running style. The one glaring downside to him is his hair – an afro that has been cruelly waylaid by gravity, but I’m sure with sufficient coaching and experience, this will give way to a more composed Caesar. There was one moment in particular, when stretching to clear a volley off the line, that Johnson stood out as a defender of great potential. As with three of Leeds’ four goals, it was a lapse in defensive concentration that allowed the Whites to go ahead in the 13th minute as Luke Parkin was allowed to run unchallenged into the area and from the edge fire a low shot past Daniel Wilks into the bottom corner. It was a great finish, but he should have been closed down. The second goal was the result of a long ball launched past the far post. There, a Leeds striker brought the ball down, ostensibly with a bit of help from his lower arm, and had although his shot was blocked; Parkin was again on hand to net from the resulting fracas. Watford had not been massively outplayed, but had paid the price for giving away a bit too much ground territorially. Though neither side had a command of the game, the Hornets’ defensive positioning meant that Leeds were able to remain on the front foot. Dave Hughes tried to remedy this at half time as he brought Alex Jakubiak, the young Scottish international for English, changing formation along with personnel. Jakubiak was placed up front to partner Mensah, with the midfield four taking some sort of fluid form that was impossible to pin down. Bawling switched from left to right, but seemed to be taking up a more advanced and central role, while Ollie Cox was the leftest of midfielders without ever getting as far as the wing. Fluidity is of course the secret to the great attacking teams (Manchester United ’06, Barcelona ’10, Watford ’12), but the players did not seem comfortable with the lack of a definitive shape, nor was there ever really any width to the midfield. Leeds took a firmer grip of the game in the second half, with Chris Dawson – who was on the bench for the senior side when they got hammered 6-1 by some nobodies a few weeks ago – pulling the strings. Dawson was at the centre of everything and with his Modric-like flair was a clear choice for Man of the Match. When Watford did construct attacks – which, to their credit, they did a lot more of in the second half – it was largely through the middle, and every through ball seemed to be just that bit over-hit. It’s a tricky skill, certainly harder than a similar ball from wide, which makes the lack of width harder to understand. In O’Nien and Bawling there were certainly technically gifted players on show, but nothing seemed to come off. Leeds were always on the front foot, however, and made it three when Kalvin Phillips’ long drive took a deflection and looped onto the crossbar with Wilks beaten. Whenever the ball was suddenly found in the Hornets penalty area, it was always a Leeds striker that reacted quickest, and this was no different – Lewis Walters gobbling up the rebound. The fourth goal was not long coming as a shot from the impressive Alex Mowatt, Leeds’ captain for the night, took a big deflection and arced over Wilks into the top corner. It’s true that luck went against Watford with three of the four goals – two deflections and a handball – and when that happens it can take the wind out of your sails, but all three could have been dealt with better. Wilks made a couple of fantastic saves, one a point-blank parry from a strong Walters’ header. Mensah, finding the ball at his feet in a modicum of space for once, got the fans on their feet with a blistering run, leaving a Leeds defender in his dust before just failing to round the keeper. Bawling showed neat trickery on the wings, whilst Jazzi Barnum-Bobb (JAZZI BARNUM-BOBB!) showed in bursts that he’s a capable attacking full back as well as a solid defensive one. The 4-0 scoreline was harsh on the side, but the result wasn’t. On the day, Watford were outplayed. But at this stage of their careers, results aren’t everything. It’s an oft maligned characteristic of youth football that results are everything, and so physical specimens are held in greater esteem than technical players. Some boys develop quicker than others – what is important is that strength, conditioning and other genetic attributes are used to build on skills and footballing nous. More-or-less all of these boys will be back again next year, bigger, stronger and having built on the technique they have clearly already started acquiring. Not this year though. Now is the winter of our discontent. 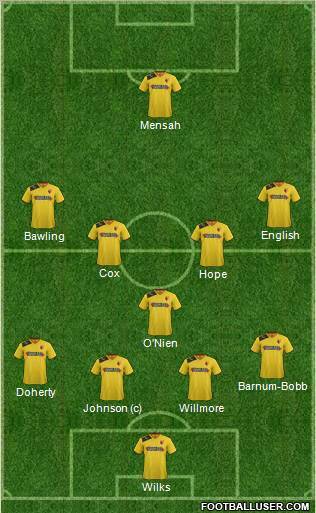 WATFORD: Wilks; Barnum-Bobb, Willmore, Johnson (c), Doherty; English (Jakubiak h/time), O’Nien, Cox, Hope (Cumberbatch 55), Bawling; Mensah. Subs not used: Calvin, Young, Eaton. 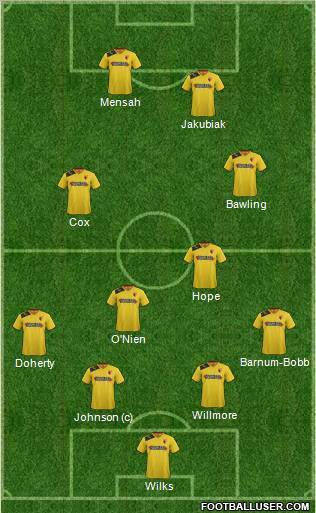 LEEDS: Grimes; Coyle (Stokes 87), Coker, Skelton, Tiesse; Mowatt (c), Dawson (Cook 87), Purver, Phillips; Parkin, Walters. Subs not used: Atkinson, Roper, Booker. GOALS: Watford; none. Leeds; Parkin (13, 33), Walters (57), Mowatt (73).